Articolo : ANSCMCM075B Disponibilità : PochiPz. The rise of the company Audi is undoubtedly one of the most fascinating stories in the 100-odd years of automobile history. It began with one special name: August Horch. In June 1909, the top management of Horch decided that its founder August Horch had to leave the company. Undaunted by this twist of fate, August sought to launch a new automobile plant on his own. Only four weeks later, his dream virtually came true: The August Horch Automobilwerke GmbH & Co. KG was officially registered in Zwickau, Saxony on July 16, 1909. But the Horch plants took August to court, claiming exclusive use rights of the name Horch for themselves. August Horch lost the trial and had to find a new name. He wound up renaming his new plant Audi , the imperative case of the Latin verb audire – meaning Horch! in German. 2009 marks the 100th anniversary of Audi. This is reason enough for CMC to introduce a real classic miniature: the Audi Front 225 Roadster. 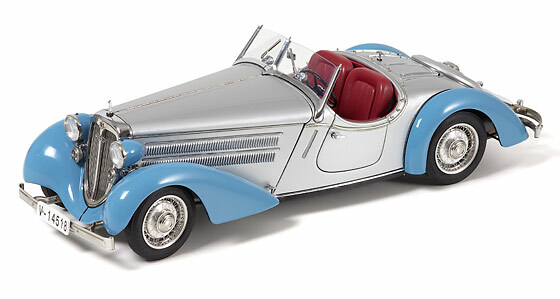 First presented to the public in 1935, the car proved to be a real sensation for its time. Sporty and graceful, its body was a feast for the eyes. The aerodynamic line management enhanced the charming sporty look of its overall configuration in particular. CMC offers this ravishingly beautiful hand-assembled miniature of more than 1,600 single parts in three different two-tone colour versions. Each colour combination brings out the glamour of this extraordinary model in a special way. Celebrate with us 100 years of Audi.